Heads-up! 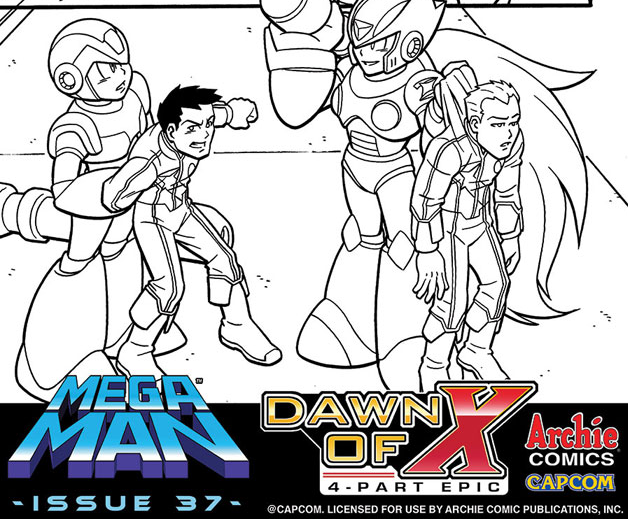 Comics Alliance has posted a preview for Mega Man #37. It's a little different from the usual samples: no color, all line art. It's by no means a large preview, but it does provide us one major curiosity: a panel depicting X and Zero apprehending a pair of humans. Who are they? Why are Maverick Hunters laying down the law on humans? Well, speculation says they're Emerald Spears members. The anti-robot/human supremacist group appears to be alive and kicking in 21XX, possibility due to the influence of Xander Payne's time travel shenanigans. It should be interesting to see how this plays out. For all the action, swing over to Comics Alliance. Why are X and Zero so much bigger than them? it doesn't look right. Indeed. Isn't X suppose to be 5 feet 3 inches tall according to official source books? And Zero around 5 feet 7 inches? Those are some wee humans. Source books..... Word of advice Capcom doesn't know what they are talking about when it comes to the heights of most of their characters so don't take it to face value. Either way if X was 5 3 or 5 5 Zero should be at least 6 feet seeing as he is depicted as being a foot taller than X in most official media. So maybe that explains Zero kinda being so tall in that picture, actually no not really. I'll be sticking with the little people argument. I agree! You don't see X and Zero next to many humans; Dr. Cain's the only one I can think of. If reploids are this large (and pack as much firepower as they do) I can see how they could elicit a lot of concern from people. Wow. Humans in the future sure are tiny! Wonder why Dr. Cain is so freaking gigantic compared to these kids? Oh, wait. Maybe that's it; maybe they're kids. Problem solved! What a ugly art cover. Thats why it is not so japanimated to to me at all. An obviously different artist.. Really ugly drawing. I am glad that I do not own them anymore since an artist was changed to another artist. No thanks. By which I mean not pixel art. Sorry for the confusion. This is all "pixel art", though. Digital, drawn on a tablet + PC. Just way more pixels involved here. Personally I'm more bothered by their faces and eyes than height. They don't even look like people that would be in the MM series. I'm chalking this one as artist error; weird or wrong size proportions due to the angle.